Tam Harbert writes about technology, business and public policy from Washington, D.C.
As enterprises embrace cloud computing, the role of the CIO is evolving — and so is the role of their IT service providers. CIOs are becoming technology and IT supply chain managers. In addition to overseeing the design and implementation of technology, CIOs increasingly source IT services from external providers. Some of these services run on-premises; others, in the cloud. CIOs must orchestrate it all to keep IT aligned with the business. To compete in the new world of IT as a Service, supply chain providers are also transforming their internal operations, undergoing the same changes as their corporate CIO customers. Rather than simply developing and managing customer projects, IT service providers now run and manage a wide range of services for multiple customers in multiple configurations. The services may be on the client’s on-premises private cloud, the public cloud, the client’s private cloud in the service provider’s data center, or any combination of the above. Tata Consultancy Services (TCS), headquartered in India, is a good example of a global service provider that is broadening its services. Historically, TCS had earned approximately three quarters of its revenue from application development and maintenance. But by 2007, that had fallen to 50 percent. It has continued to fall, reaching, in TCS’s most recent fiscal quarter, less than 45 percent of all revenue. At the same time, TCS has expanded its offerings in IT infrastructure and managed services, business process outsourcing, enterprise solutions, mobility, big data, digital marketing, supply chain management and consulting. Today, infrastructure services account for more than 11 percent of revenue at TCS, a growth rate of nearly 34 percent over the past year, according to the company. Similarly, business-process outsourcing now accounts for more than 12 percent of TCS’s revenue, up by more than 39 percent since the same quarter last year. And enterprise solutions account for 15 percent of revenue, a 16 percent increase over the year-earlier quarter. PM-Partners Group has seen a similar expansion of its services into the executive suite. The Australia-based company was established more than 17 years ago, running projects and supplying project management staff to corporate clients. Since then, PM-Partners has become one of the most highly accredited project management companies in Australia and has expanded its consulting capabilities to provide health checks, advice and process improvement. The company now advises CIOs and other executives on managing project portfolios, whether internal, external or both. PM-Partners can even take over a company’s entire project management function, creating and operating a project management office under a “managed services model” that can also be transitioned back to the client at a later date. Stefanini, another IT services provider, is similarly transforming itself into a global provider of high-value services. The company, based in Brazil, is expanding globally to provide multinational corporate customers with a worldwide footprint. Stefanini was launched in the mid-1980s as an IT-training company; in the last six years, the company has increased its presence in North America, Europe and Asia through a combination of acquisitions and organic growth. Stefanini’s acquisitions have also brought new capabilities, including IT infrastructure outsourcing and ERP consulting services. In 2010, Stefanini acquired U.S.-based TechTeam Global and CXI Inc., not only expanding the company’s footprint in the United States, Europe and Asia, but also increasing its capabilities in service-desk support and ERP consulting. With the acquisitions, Stefanini can now offer services in more languages, and at more locations globally. The operations of Stefanini and the acquired companies complement each other well, according to Scott Kessler, Director of IT Outsourcing Solutions at Stefanini. For example, a multinational customer that might have used Stefanini for help desk services within Latin America could now offer the same services to customers in North America, Europe and Asia. Stefanini has also transformed the portfolio of services it offers in North America. In addition to IT service-desk services, the company now provides ERP consulting, mobile application development and support services, along with recruiting and staffing. The pull of convergence has also led global telecommunications companies to transform themselves. Verizon and other telecom giants want to provide new, additional services to enterprises, says Nik Willetts, Chief Strategy Officer for TM Forum, a non-profit industry association of service providers (including the largest telecom companies), enterprises and other organizations. After all, he adds, communications providers are already trusted partners of large corporations, providing their expansive networks and expertise — the lifeblood of IT — as a service. Many telecom companies are now moving to provide Infrastructure as a Service (IaaS). They also seek to bundle IaaS with third-party software and services. In this way, telecom companies will serve as systems integrators of IT services. Which service providers will do that job in the future? 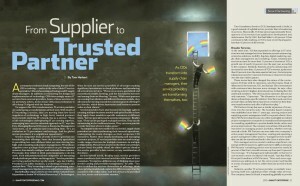 Those that CIOs learn to trust.